The Opal Guitar Quartet is a group formed in early 2014 that has undergone many member changes since. As it now stands, the group consists of guitarists Emanuel Auciello, Dylan Boller, Caleb Lavery-Brook and James Rawley. Based in Adelaide, South Australia, they enjoy performing both as soloists and in the quartet. They are all students of Oliver Fartach-Naini-Naini and are currently studying at the Elder Conservatorium. The quartet has been fortunate to have had tutelage with leading guitarists from around the world including Slava Grigoryan (Australia), Lee Song Ou (South Korea), Vincent Lindsey-Clark (United Kingdom), The Beijing Guitar Duo (China) and their teacher Oliver Fartach-Naini from the Elder Conservatorium of Music in Adelaide, South Australia. 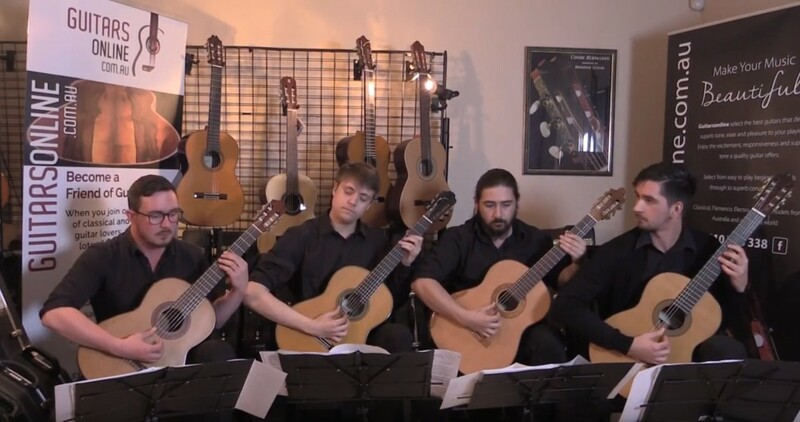 The Opal Guitar Quartet pemed at the 3rd South Korean International Guitar Festival in 2017 and recently performed at the Sydney Guitar Summer School in the beginning of 2018. The group is a large advocate for promoting Australian music and is looking forward to working with local composers in the near future. This is testified by their premier performance of the guitar quartet version of Adelaide based composer Anne-Cawrse’s Skittled (originally written for the ASQ - The Australian String Quartet).